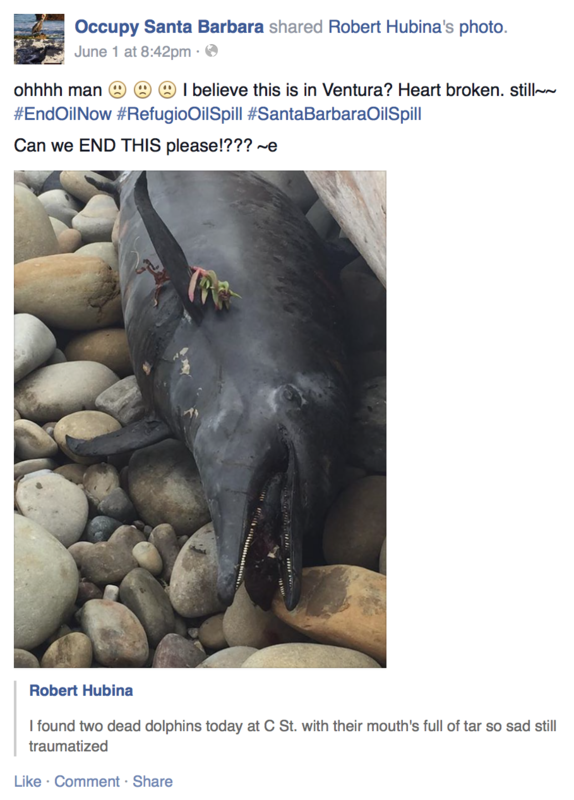 Facebook posting of dead dolphin in Ventura in the wake of the Refugio Oil Spill. On Monday alone, responders organized by the California Department of Fish & Wildlife and the Oiled Wildlife Care Network recovered the bodies of 30 dead sea birds (mostly brown pelicans) and 13 marine mammals (mostly sea lions). Five oiled birds and two mammals were found alive. 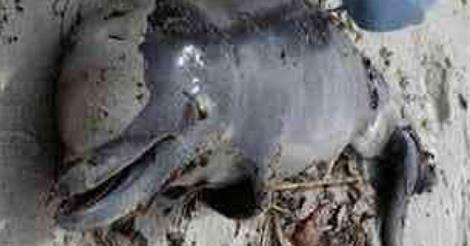 Since May 19, nine dead dolphins — some with mouths full of tar — have washed onto South Coast beaches. A total of 45 mammals and 80 birds have been found dead in the last two weeks. Of the 57 live birds and 38 mammals rescued, eight birds and seven mammals died in care. Body counts for fish, crustaceans, and other types of intertidal animals were not immediately available. Conspicuous vertebrates impacted by the Refugio Oil Spill. Data from May 19-June 1, 2015. Source: Joint Incident Command. 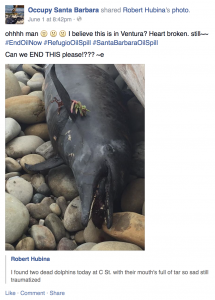 Dolphin kill that washed up in Ventura in the wake of the May 19, 2015 Refugio Oil Spill. Image source: Naples News. To be sure this spill has impacted and undoubtedly will be impacting many more conspicuous marine vertebrates in the days to come. We should be counting these impacts, working to minimize further impacts, and (post clean-up) restoring these systems. With every picture and data point, the pressure to do something can seem tremendous. We all feel this. But rushing to judgement as to what happened, while understandable, rarely produces the best possible policy response. 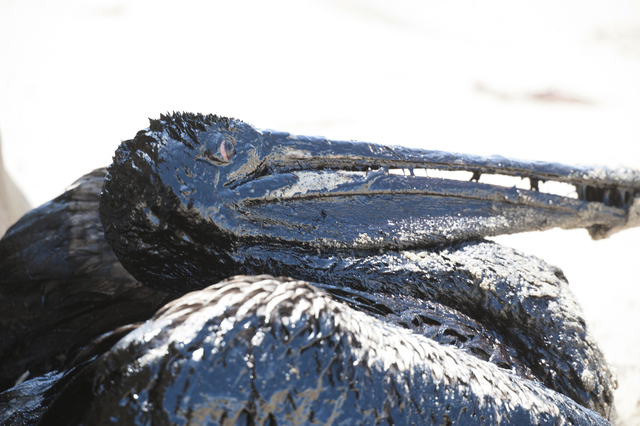 A pelican covered in oil sits on a beach about a mile west of Refugio State Beach, Calif., Wednesday, May 20, 2015. Image: Kenneth Song/The News-Press via AP. Clearly those in the media spotlight (e.g. Plains All American, the Joint Incident Command) seek to tamp down speculation and minimize the hit to their public image. On the other side, advocates for reduced dependence on oil or who dislike their homes and businesses being spoiled by hydrocarbons see this as their opportunity to strike while the iron is hot. The environmental community is particularly charged up by this event and see this immediate post-spill period as a key time to make progress against increased drilling and a carbon-intensive economy. It is important to understand that this spill comes in the wake of the defeat of the anti-oil constituency’s anti-fracking ballot Measure P by what was widely viewed as “outside money” from the oil industry in last November’s Santa Barbara County elections. This spill only added insult to injury in the minds of many environmental activists in Santa Barbara County and has sparked a renewed interest in getting something done. Political fortunes will rise or fall based on what happens. California Attorney General Kamela Harris is running to replace Barbara Boxer in the U.S. Senate and her investigation into the Refugio disaster could boost her cred with green voters. Lt. Gov. Gavin Newsom, a most ambitious politician, casts one of the three votes on the state lands commission. In the race to replace retiring U.S. Rep. Lois Capps, a Santa Barbara Democrat and staunch environmentalist, the impact of the Refugio spill will loom very large. “If we do nothing, and then something happens again, then shame on us,” said Sen. Hannah-Beth Jackson, D-Santa Barbara. Jackson said she will submit legislation designed to beef up the state’s pipeline inspections and also to empower local fishermen to quickly respond to marine oil spills. Assemblyman Das Williams, D-Carpinteria, will propose a bill to require all oil pipelines in offshore or near-shore areas be equipped with automatic shut-off valves, which the Plains All American Pipeline’s facility did not have. “From what I know of the gap in time from when they knew something about the spill and when the cleanup began, I think it’s safe to say an automatic shut-off valve would have reduced the scale of the spill,” he said. Because it is well past the deadline for introducing new bills in the Legislature this year, Jackson and Williams intend to strip the language from existing bills and amend them to include their oil spill-related proposals. Jackson noted that it took six hours for boats from Los Angeles dispatched by the state Office of Oil Spill Prevention and Response to arrive in Santa Barbara. Had the crews of local fishing boats been trained and equipped, she said, they could have responded much more quickly to begin the cleanup. The proposal is modeled after a program already in place in Alaska. Although the details have not been developed, Jackson said she envisions having state hazardous materials experts train willing fishermen to become volunteer responders. I’m all for change and doing things better. God knows we can improve on many, many fronts. But I would hope we do this armed with facts and not an overly worried sense of urgency stemming from appeals to pathos. There is much more to the story than those charismatic critters. Amongst other things, I would hope for an improved monitoring network of ecological and social systems, cheaper and more portable/rapidly deployable response systems such as the ROV technology we are developing in my lab, etc. Only time will tell how this all turns out. But one thing is for sure; the more oiled dolphins we see, the less of a reasoned approach we all will take.